^ Record, Jeffrey (2010). 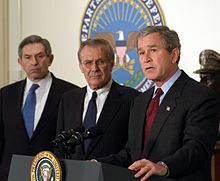 Wanting War: Why the Bush Administration Invaded Iraq. Potomac Books, Inc. pp. 47–50. ISBN 9781597975902. Retrieved 12 June 2016. ^ Balint, Benjamin (2010). "Running Commentary: The Contentious Magazine that Transformed the Jewish Left Into the Neoconservative Right". PublicAffairs. ^ Balint, Benjamin (1 June 2010). Benjamin Balint, Running Commentary: The Contentious Magazine That Transformed the Jewish Left Into the Neoconservative Right (2010), pp. 100–18. ISBN 9781586488604. Retrieved 12 June 2016. ^ Martin Duberman (2013). A Saving Remnant: The Radical Lives of Barbara Deming and David McReynolds. The New Press. ISBN 9781595586971. Retrieved 12 June 2016. ^ Maurice Isserman (2001) [1972-12-08]. The Other American: The Life of Michael Harrington. Public Affairs. p. 300 of 290–304. ISBN 9780786752805. Retrieved 12 June 2016. ^ Vaïsse, Justin (2010). Justin Vaïsse, Neoconservatism: The Biography of a Movement (Harvard University Press, 2010), pp. 71–75. ISBN 9780674050518. Retrieved 12 June 2016. ^ Matthews, Dylan (28 August 2013). "Dylan Matthews, "Meet Bayard Rustin" Washingtonpost.com, 28 August 2013". Washingtonpost.com. Retrieved 12 June 2016. ^ ""Table: The three ages of neoconservatism" Neoconservatism: Biography of Movement by Justin Vaisse-official website". Neoconservatism.vaisse.net. Retrieved 12 June 2016. ^ Mason, Robert (2004). Richard Nixon and the Quest for a New Majority. UNC Press. pp. 81–88. ISBN 978-0-8078-2905-9. Retrieved 12 June 2016. ^ Kenneth L. Deutsch; John Albert Murley (1999). Leo Strauss, the Straussians, and the American Regime. Rowman & Littlefield. p. 63. ISBN 9780847686926. Retrieved 12 June 2016. ^ "Neocons for Hillary: why some conservatives think Trump threatens democracy itself". Vox. 4 March 2016. ^ "Elliott Abrams, prominent D.C. neocon, named special envoy for Venezuela". Politico. 25 January 2019. ^ "Are the Neocons Finally with Trump?". The National Interest. 17 October 2017. ^ "Neocon-led US Venezuela policy, rhetoric trigger deja vu effect". Deutsche Welle. 5 February 2019. 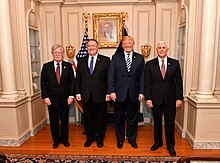 ^ "Trump's decision to withdraw from Syria and build a border wall instead marks a key moment for his 'America first' view". Los Angeles Times. 19 December 2019. ^ "The North Korea Summit Through the Looking Glass". Jacobin. 13 June 2018. ^ Brooks, David (2004). "The Neocon Cabal and Other Fantasies". In Irwin Stelzer (ed.). The NeoCon Reader. Grove. ISBN 978-0-8021-4193-4. ^ a b Krauthammer, Charles (1 July 2005). "The Neoconservative Convergence". Commentary Magazine. ^ "Jeb Bush, neoconservative". Fox News. 18 February 2015. Retrieved 12 June 2016. ^ USA. "Joe Lieberman – Right Web – Institute for Policy Studies". Rightweb.irc-online.org. Retrieved 12 June 2016. ^ "John McCain's Neocon Manifesto | The National Interest Blog". Nationalinterest.org. 29 August 2012. Retrieved 12 June 2016. ^ "Tim Pawlenty: The Latest Dangerous Neoconservative". The National Interest. 5 July 2011. Retrieved 12 June 2016. ^ David Corn (13 May 2015). "The Jeb Bush Adviser Who Should Scare You". Mother Jones. Retrieved 12 June 2016. ^ Blumenthal, Sidney (2008). The Strange Death of Republican America: Chronicles of a Collapsing Party, Sydney Blumenthal, Union Square Press, 2008. ISBN 9781402757891. Retrieved 12 June 2016. ^ "Was Irving Kristol a Neoconservative?". Foreign Policy. 23 September 2009. Retrieved 12 June 2016. ^ Matthew Christopher Rhoades (2008). Neoconservatism: Beliefs, the Bush Administration, and the Future. ProQuest. p. 110. ISBN 978-0-549-62046-4. Retrieved 12 June 2016. ^ John Feffer (2003). Power Trip: Unilateralism and Global Strategy After September 11. Seven Stories Press. p. 231. ISBN 978-1-60980-025-3. Retrieved 12 June 2016. ^ a b Danny Cooper (2011). Neoconservatism and American Foreign Policy: A Critical Analysis. Taylor & Francis. p. 45. ISBN 978-0-203-84052-8. Retrieved 12 June 2016. ^ Matthew Christopher Rhoades (2008). Neoconservatism: Beliefs, the Bush Administration, and the Future. ProQuest. p. 14. ISBN 978-0-549-62046-4. Retrieved 12 June 2016.